Raspberry vinaigrette has been my favorite for a long, long time. Toss a handful of leaves in a bowl, some raisins, maybe some peanuts, shreds of cheddar, sunflower seeds and whatever else there may be around. 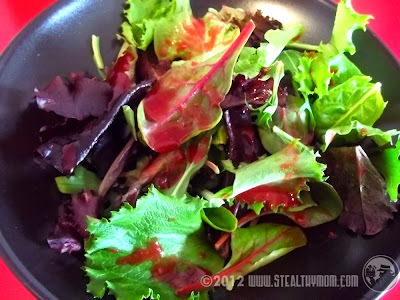 No matter what is in the salad bowl, raspberry vinaigrette makes it taste like candy. I read the label on the bottle in my fridge; that stuff is candy! The first ingredient on the list was high fructose corn syrup, followed by soybean oil. Some have canola, too. Raspberry juice was way down the list. I just had to make my own using real food ingredients. Pour boiling water into the clean molasses bottle, put the lid on and invert. This extra step will make sure it is really, really clean before adding an oil-based dressing. Let it stand for a few minutes, then pour out the water, keeping the bottle and lid inverted on the dish rack to dry. In a glass dish, microwave the raspberries just enough to warm them. Place a strainer over a glass measuring cup. With a spatula, work the pulp and juice of the berries through the strainer. Be sure t o scrape the bottom of the strainer for the pulp that collects, too. Once you have little more than a couple tablespoons of seeds in the strainer, pour the vinegar through. Add the oil and maple syrup to the dressing. Pour the dressing into the clean bottle, put the lid on and shake it to mix. Store it in the fridge. I shared this recipe at Make Your Own Mondays , Real Food Wednesdays , Simple Lives Thursdays, and the Weekend Whatever, Fight Back Friday, Ultimate Recipe Swap, Summer Salad Sundays, Friday Food Flicks and Empty Your Archives- Salad Collection. Thank you. I smacked my forehead after I tinkered around a bit and saw how easy it was. It's pretty enough for company, too. Pretty interesting. I think I might share this with my Mom cause this is right up her alley. I have to admit that I'm not really a big veggie eater though I did enjoy the Raspberry vinaigrette on the chicken salad I ordered at Bubba Gump's a year ago. It didn't make eating the rabbit food quite so bad :p I will definitely be checking out some of your gluten free recipes. I'm always looking for new good things to try. I've never tried making my own raspberry vinaigrette, but this looks so easy! Thanks for sharing this with Summer Salad Sundays, look forward to seeing you again soon!